Cruise to Llangynidr through the breathtaking scenery of the Brecon Beacons National Park, surrounded by the Black mountains & overlooking the Usk valley, passing Abergavenny & Crickhowell. 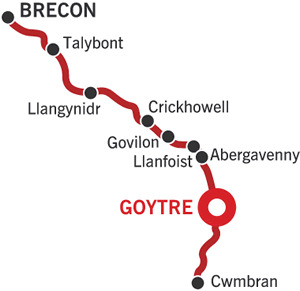 A beautiful cruise with lovely scenery, and ideal for walkers who want to explore the Brecon Beacons, and passing some Welsh towns and villages like Abergavenny, Llanfoist and Govilion. Going north from the marina the canal twists and turns through the beautiful Welsh countryside but does not pass any civilisation until the small village of Llanover on your left. The canal clings to the side of the hills, with small aqueducts taking the mountainside streams down to the valley below you. To the west the hills are very steep, rising to over 1800 ft, at times almost vertically away from the canal. The village of Llanellen is to the east from Bridge 92, there is a PO & stores here. There are traces on the hills of the old 19th century tramways that used to carry the coal down from the hills, and as you approach Llanfoist look out for the old tramway by the Boat house. The old wharf buildings were originally built for the tramway, there is a lovely walk along the old tramway into the mountains. You can moor up in Llanfoist for the 1st night, close to the Boatyard bridge if possible. It is 2.25 hours cruising from Goytre marina. There is an Indian restaurant in Llanfoist – Exotic East tel 01873 850509, or you can walk across the boatyard bridge into Abergavenny, about a mile away. Abergavenny is a picturesque town situated in the South Eastern corner of Wales, only 20 miles from the English border. It lies beside the fast flowing River Usk & is steeped in history and enjoys an enviable position close to the beauty of the Brecon Beacons national park- Sugar Loaf, Blorenge & the Skirrids overlook the town. The museum & castle are in Castle street, the mound of the castle dominates the town. It was built in the 11th century and now houses the museum which tells the story of the town from prehistoric to modern times. In addition to High Street stores there are loads of local shops selling a huge range of individual gifts as well as local arts &crafts. Plus, Abergavenny is still very much a market town with a recently refurbished market hall hosting Antiques & Collectors Fairs, Local Produce Markets and more. With a wide variety of pubs, take-aways & restaurants in Abergavenny there is bound to be an establishment to cater for your your culinary tastes. Still heading north you start off towards Govilion, which cannot really be seen from the canal, but steps by the aqueduct lead down to it. There is a PO & stores here & the Bridgend Inn is below the aqueduct. Tel 01873-830177. There is also the Lion Inn in the village tel 01873 830404. Gilwern is soon reached – the canal turns sharply before the Wharf. There is a useful well stocked gift shop at bridge 103, and a PO & stores in the village, pubs are the Bridgend Inn & Navigation Inn canalside at bridge 103 or Beaufort Arms just down the hill from the bridge. 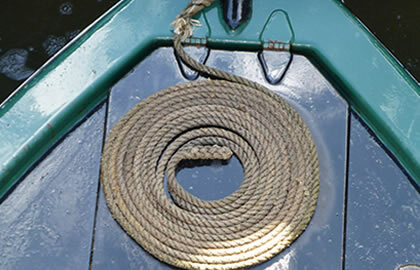 The approach to Llangattock is through flatter country, the village is best approached from bridges 114/115, Llangattock wharf is a busy mooring site, and there are a range of old limekilns by the stone wharf buildings. There is a pub called the Horseshoe Inn to the east of bridge 116. Through the village of Llangattock, about a mile from the canal, is the lovely town of Crickhowell.To the south the town is bounded by the River Usk which has a 16th century 13 arch bridge across it , to the north are the Black Mountains, the eastern range of the Brecon Beacons national park, this area is a good base for exploring the Brecon Beacons. There are opportunities for caving in the surrounding hills, and easy or strenuous walking, also horses can be hired from Golden castle Riding stables in Llangattock. There are 2 challenging mountain bike trails starting from Crickhowell, and bikes can be hired locally. There are a variety of shops & pubs in the town. The Bridgend Inn Tel 01873 810338 is well worth a visit, and the Bear Hotel has won many awards for its excellent food tel 01873 810408. The canal continues its north westerly route along the River Usk valley and you can moor up near bridge 129 which is the best access point for Llangyndir. The Red Lion pub is in the village. You can turn just before bridge 131. It is 5 hours cruising from Llanfoist wharf to here. It is 7 hours to get back to Goytre marina from here.